Make a pin for Pinterest once, then use and reuse it as a template forever. 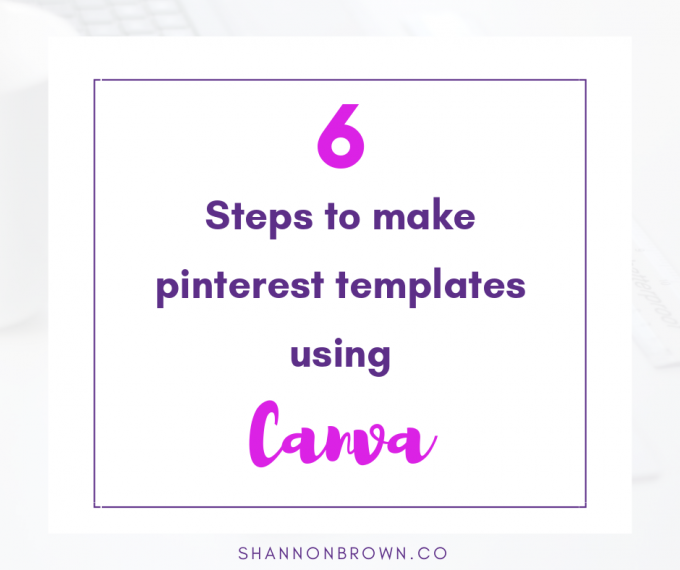 If your goal is to make professional-level pins with text on them, this these six steps to creating a Pinterest template on Canva will be exactly what you need. Canva is fun to use and the results are great. Not only that, they’re great every time if you make a template. A template also gives you a perk if you’re using the free version of Canva. In the paid version, you can save your brand colors so you don’t have to re-enter them for every project. If you make a pin template and use that to make a new pin, then the colors stay with the template and will be there for you every time. If you already have brand colors and fonts — those are colors and fonts that you’ve chosen to use on all of your projects — skip to Step 3. You’ll need three or four colors to use for your pin. Black and/or white can be one or two of those. I chose my brand colors by finding photos I liked on Pinterest and pinning them to a secret board. I saw a pattern pretty quickly. I just discovered a new (I think it’s new!) Canva tool, Color Palette Generator. Upload a photo here and it will give you the colors in it with their color code. You can use that color code in your Canva project. Please choose legible fonts that can be easily read. A mix of serif, sans serif, and script is great. Serif is the little foot that sticks off of a letter in a traditional font, like in Times New Roman. Here are some great fonts to consider. 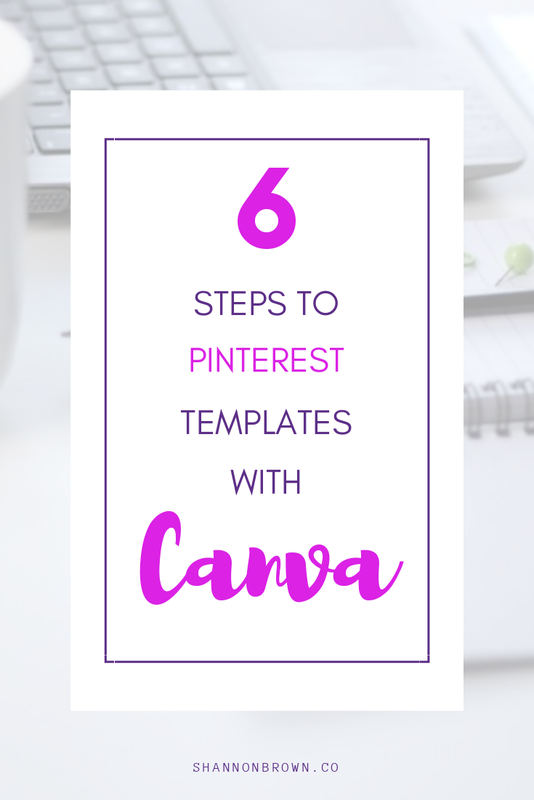 We’ll use Canva’s premade Pinterest template because it fits Pinterest’s new requirements. If you’re new to Canva, go to Canva.com and sign up for a free account. There is a paid version, but it isn’t required for many of us. I use the free Canva. At the top of the page, you’ll see “Create a design.” The Pinterest size isn’t here. Click the large plus sign to the right. The size you need is under “Social Media Posts.” Click it and a new window will open with a blank box in it. Premade layouts are the best thing for those who are new to Canva and new to graphic design. They also just make it easier for everyone. Don’t worry about the images, fonts or colors. Everything can be changed. If photos aren’t huge for your brand and subject, you’ll want to choose one where there isn’t a photo or it’s more of a backdrop. You also want one with text that will be easy to read, so a tiny box in the corner with text you can only read full-sized wouldn’t be right. Scroll through the templates. The closer it is to the layout you want, the easier it will be. ALL colors and images and fonts can be easily changed. I picked one with a number already on it because this post’s title has a number in it and I often write posts with similar titles. I also purposefully chose one with a background image because I prefer that as opposed to one that just has a color or a pattern for the background. Think about what you want your pins to look like. Is your business pretty and feminine? Bold and sassy? Traditional or cutting edge? Do you plan to use one image or more? If it has a photo or photos on the one you’re considering, ignore the pictures completely. Pretend they aren’t there. Look at the text and how it’s laid out on the pin. Is there already room for what you want to write on it? Now, it’s time to make this pin match your business’s brand. If there is a background photo, you need to delete it. If you’re thinking, I’ll just put my photo on top of it, you’re right, you could do that. But if the original image isn’t a free one, then you will be asked to pay for it when you download — even if it’s hidden. I’ve had that happen. Click on the photo and when you see the dashed lines around it, click delete on your keyboard or the trashcan in the upper right corner. If you now see a picture of clouds, blue sky and a cloud, you’re looking at a photo grid. Your photo should pop right into it when you click on it or drag it over. If it gives you any problems, pop over to my post on photo grids and you’ll soon have it sorted out. For a new photo, you could choose one of Canva’s, either free or paid. If an image has a grid pattern over it, that’s showing it’s a paid image. (Read their terms here.) Or you can use a photo you’ve taken or one you’ve bought from a stock photo site. I’m using one I got from DepositPhotos, my go-to site. Tip: If the photo isn’t showing the part of it you want it to, you can make it larger or smaller by pulling on the corners of the photo. You can also click and drag the image to move it. To change the colors of text or elements such as a square or circle, click on the item. Watch the bar above to see if a colored box appears alone or a colored box with text appears, and you’ll be more sure you’ve clicked on the thing you wanted to change. Not only will that color change in this project, but it will now be part of your template and you won’t have to enter it again. The color will show right away the next time you click the colored box. If you need to change the font, simply click the text, then the font’s name in the bar above. Sort through the fonts and choose the one you want to use. If your brand’s font isn’t one of the standard ones Canva provides, you will need to either substitute to one that is or use the paid version, Canva for Work. You’re then allowed to upload fonts. If there is more than one box with text because there are different fonts or sizes of text, you may find that when you click on one, dashed lines appear around the whole text area. This is a Group. That text was purposefully connected so it could be moved as a unit. You can change each part of it by just clicking on it. If you need to delete or move part of it, simply click on the group of text and then “Ungroup” on the bar at the top. You can center by clicking and dragging until you see dashed lines vertically, and for the middle of it also horizontally making a cross. Click on the name of the project above your new template and rename it Template 1 (or whatever name makes you happy). You now have a template. Never mess with it. You’re done! Click “Download” at the top of the page. When you want to use your template, click on File then Make a copy and use the new one. If you think you might mess up and change your template (as I have on occasion), make a copy now and give it a different name. Keep your templates undisturbed. Do you love what you made? You could try making a few pins with a similar title, but not exactly the same. Pinterest suggests linking multiple pins to the same place. 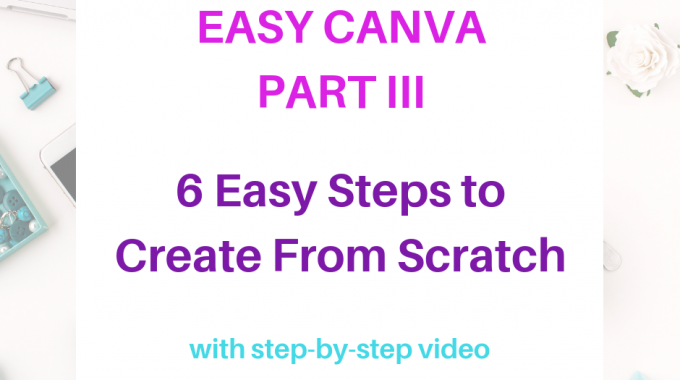 If you’re new to Canva, I suggest starting with the free Easy Canva series with short videos. 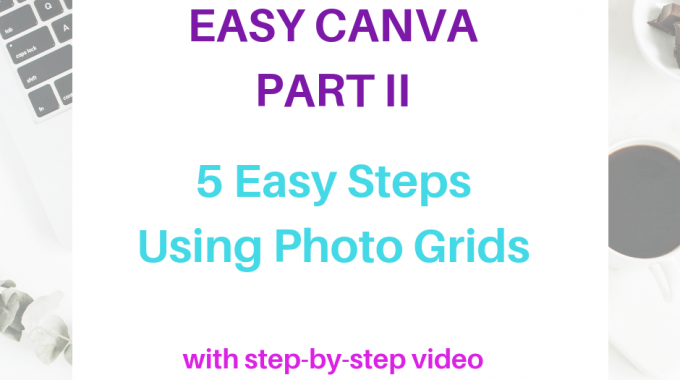 The series leads you through layouts, photo grids and starting from scratch. 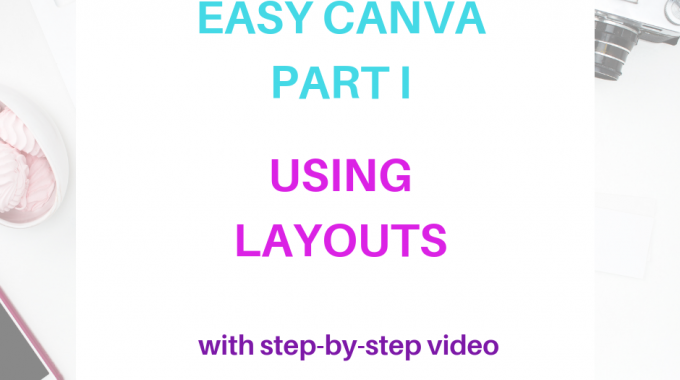 Was this your first time using Canva or just your first try at making a template in Canva? Either way, I’d love to see what you made. Please leave a link to your pin in the comments.